If there is one thing an All-Star Game ought to be, it is fun. It doesn’t matter which sport we’re talking about. The event is for fans to celebrate the stars of the game and for everyone to have fun. We also shouldn’t forget the All-Star Game is also about making money, which includes promoting the game and helping fans connect to the league’s products. This value can extend decades into the future. Generating headlines, heartwarming stories and memorable moments are incredibly important. The John Scott All-Star appearance is an example of how an All-Star Game becomes a rising tide which lifts all boats. When a special opportunity occurs, the game has to rise to the occasion. There is a chance to rise to the occasion this season, for the 2019 NHL All-Star Game. Joe Thornton, fondly known as Jumbo to the fans, leads all active players in scoring and sits high on several all-time NHL lists. 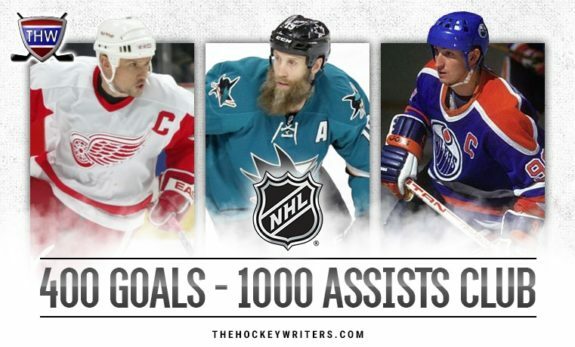 On the list of all-time assists leaders, Thornton passed Mario Lemieux and Marcel Dionne earlier this season. He might get to ninth by the time the All-Star Game occurs, a spot occupied by Gordie Howe. Legends all. At the heart of Thornton’s All-Star Game case is this. He’s the best and most important player in San Jose Sharks history and the All-Star Game is in San Jose. Thornton owns a ton of team records and has keyed plenty of playoff wins. Given the company he’s keeping, he’s a legend. When you get the chance to honor a legend in their home venue at an All-Star Game, you do it. It doesn’t matter whether the player is having a good season or not. It doesn’t matter what sport it is. Give the fans a reason to stand up and cheer, long and loud. It is a ‘thank you’ which can only come in this sort of forum. Want to connect fans to the game? This is exactly how it’s done. As of now, the Sharks have three entrants into this season’s All-Star Game and all are deserving. Joe Pavelski leads the Pacific Division in goalscoring, while Brent Burns and Erik Karlsson are first and third, respectively, in points from defensemen. But ‘deserving based on this year’s play’ doesn’t need to be the sole selection criteria for an All-Star Game. We’ve seen examples of legends included in All-Star Games before, even away from home venues. One example is baseball legend Cal Ripken. In the midst of a miserable season, he was voted into the game in Seattle. On merit, Ripken didn’t belong anywhere close to the game. Seattle is 3,000 miles from Baltimore where Ripken played his entire career, but it didn’t matter. The fans understood it was time to say “thanks” to a legend. And they did with a lengthy standing ovation prior to his first at-bat. Ripken, ever one to seize the moment, stepped into the batter’s box and hit the first pitch out of the park for a home run. All-Star Games live for moments like this. Pretty much every list of great baseball All-Star moments includes Ripken’s at-bat. There is no NHL player who could deliver this sort of moment in this All-Star Game other than Joe Thornton. When you have the chance to honor a genuine legend of the game in front of the fans who adore him, you do it. Every single time. If an All-Star Game goes to Pittsburgh a few years down the road, I don’t care if Sidney Crosby merits inclusion in the game. Put him in. Ditto for Alexander Ovechkin in Washington. It is as ‘no-brainer’ as it gets. For most players, an All-Star berth is a nice honor. It’s given to players who’ve played exceptionally well. I won’t argue with any of the selections, though there are always players who’ve been left out with a compelling case based on their season. I could try to make the case for Thornton in other ways, but these are unimportant. Yes, he’s been snubbed plenty of times. He hasn’t been selected for an All-Star Game in the last decade, for reasons which make no sense. But including him now isn’t about correcting past mistakes. Thornton’s also been a good player this season. He is among the best third line centers in the league, which is not nearly enough to get selected on a merit basis. The good news, though, he wouldn’t be out of place skating with the league’s current elite. 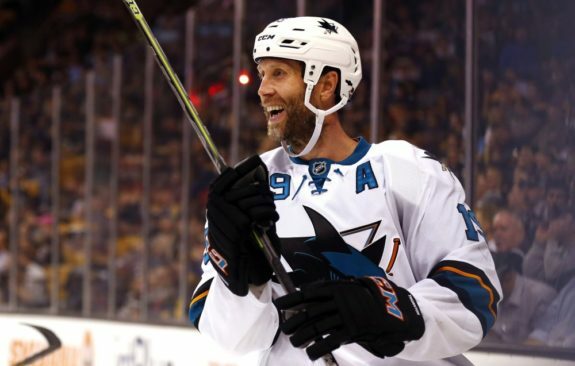 Thornton does epitomize much of the best of hockey. He’s a fun-loving good guy, from his epic beard to his shirtless stroll around Pittsburgh during the Stanley Cup Final. He’s also tough as nails, as shown when he played on torn knee ligaments in the 2017 playoffs. And he’s a notoriously hard worker, recovering from multiple major knee surgeries in the past two years to play effective hockey. Memories are essential to the All-Star Game and relatively games few deliver. 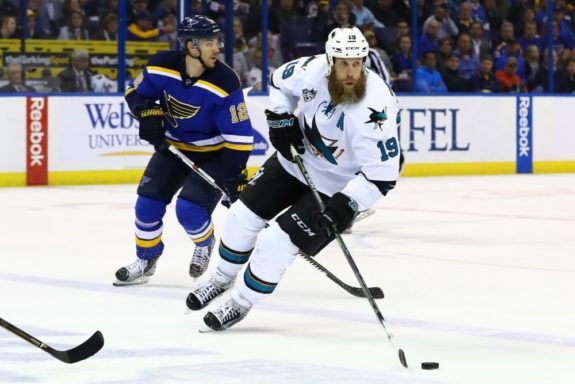 Put the All-Star Game in any venue in the league other than San Jose and there’s no case for including Thornton. But the game is in San Jose, and the case is instantly compelling. No player would be better for the All-Star Game itself, for the fans and for the league than Thornton. Before the league paints itself into too far into a corner, it needs to correct this mistake. When you hold an All-Star Game, you want a big event. In this case, make it a Jumbo event. 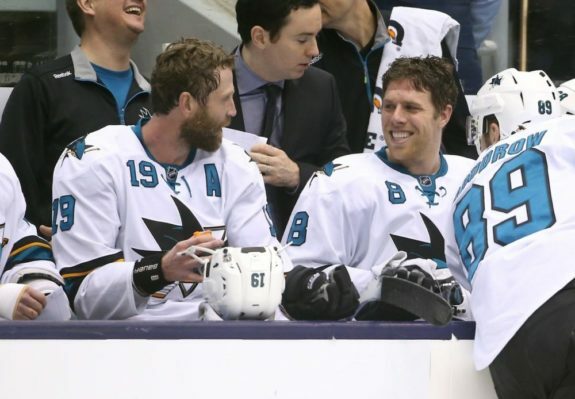 Thornton’s fun-loving side comes through in the current run of Sharks commercials. If Sharks fans (and coaches) have one complaint about Thornton over the years, it’s his reluctance to shoot the puck, or in the parlance of the game, to ’pull the trigger’. The most recent commercial features Thornton playing chess opposite Barclay Goodrow and well, you can watch it here.